mrs sew & sow: A finish in no man's land! 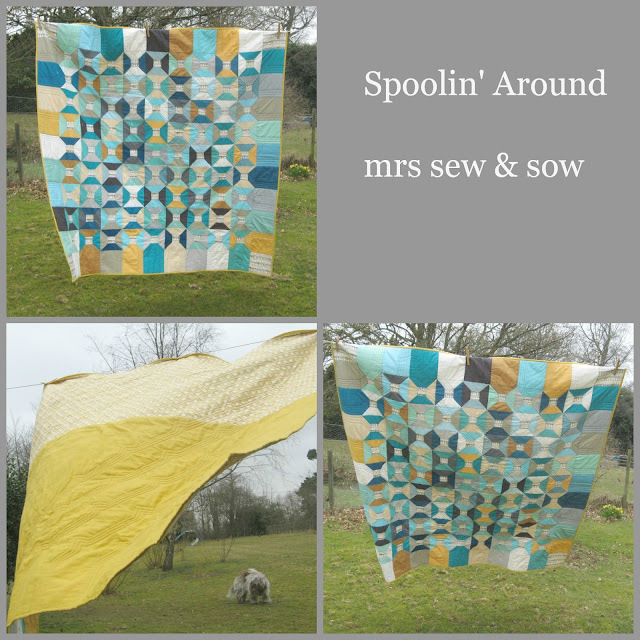 Well fellow FAL-lers (Finish-A-Long - a group of people trying to finish their UFOs) I was disappointed not to finish my spools quilt by the end of March but I have now finished it in No-man's-land: that bit of time between the end of quarter 1 and the beginning of the next! And here it is - now named Spooling Around thanks to the fabulous Helen! It would have been finished on time but for a bit of unpicking of quilting required to smooth it out at the back. It is pretty plain with just two fabrics and shows up any misdemeanors and some little pleats just didn't add to the attraction....love the pattern on the back now though! Of course the sun didn't come out today...but Maddie did! I love this quilt, I keep wanting to look at it more and I just love how the solids worked so beautifully on it. Good for you Nicky. You made it! I'm pretty sure you can still link it up, Leanne gave an extra week :) Nice work! That is a fab wee mosaic Nicky, and a super duper quilt.I think you are ok to link too. Woo hoo! A great finish! I just love the colors you're using here. They're so pretty together! Well done, you. Oh I love it - a fantastic finish, no wonder you couldn't keep it until Q2! Well done Nicky, it dosen't matter when you finished it- it's a finish all the same . Looks great Nicky, congrats on another finish! What a fantastic finish-and a great name! It looks great, well done! I think I need more sleep though, I totally read the title of this as 'a fish in no man's land' when I saw it in my dashboard, and I couldn't think for the life of me what you could possibly have done to a fish! looking great! love the back view, you can really see the quilting there. Hooray!! well done, it looks fantastic. It's really really super pretty and sophisticated Nicky - yea for a fab finish!! ah you don't need the sun with that fab quilt, it's quite sunny enough. Love your colour palette on this one. fab. It looks great! Really like the way you've done the border.